BECAUSE she was brought across the Pacific from Indonesia for inspection and overhaul, special interest of West Coast maritime people has been directed to the Standard-Vacuum Oil Company's tanker Slanvac Wellington, on which the Moore Dry Dock Company has just completed a nice job for General Petroleum Corporation. 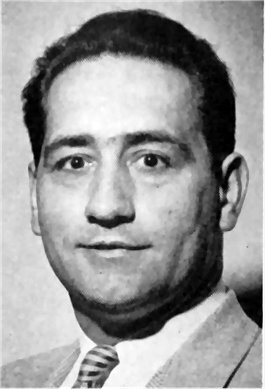 Advisory Chief Engineer Charles A. Ruggerio was loaned to the operators and flew out from New York to Sumatra to bring the ship to the Oakland yard, and Superintending Engineer Ray Jones of General Petroleum supervised the work. C. E. Dole is manager of the Marine Department at San Francisco. 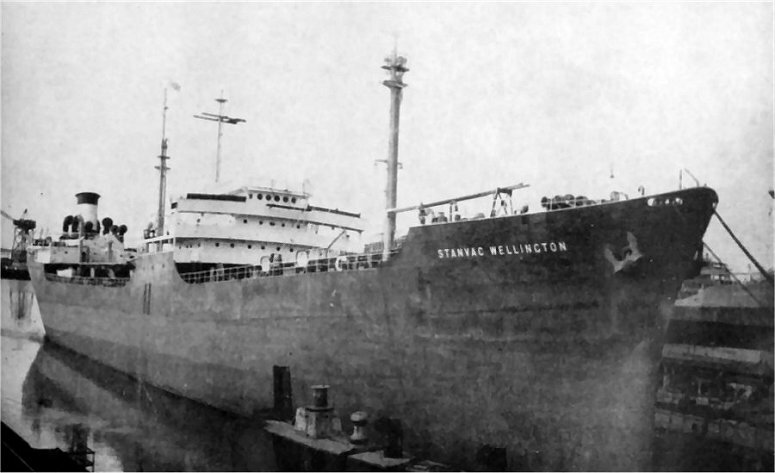 The Stanvac Wellington is a 500 foot vessel of 16,720 tons deadweight, built by Sun Shipbuilding and Dry Dock Company in 1941. Her power plant consists of two Babcock & 'Wilcox water tube boilers, with Westinghouse turbines developing 4400 shaft horsepower through double reduction gears to a single screw. The vessel had been in the South Seas for quite some time, and there had developed a long list of required repairs, renewals, and replacements. Also, there were some important betterments decided upon. 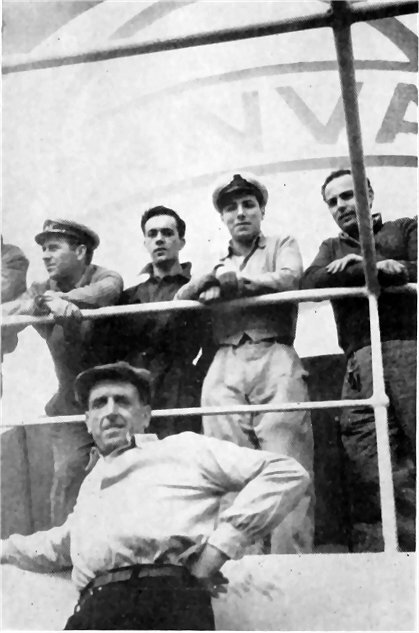 Group of officers of "Stanvac Wellington" Capt. A. Rubino (below) with his Second Mate, Third Assistant Engi-neer, Jr. Mate and Chief Mate. This constitutes a reminder that, as pointed out elsewhere in this issue, there are many hundreds of ships in the American Merchant Marine which have not had major overhauls since they were built or converted following or du-ring the war, and all of which will need more or less of shipyard work during this year. Betterments will be in order on many of them, as new devices and processes are required in the interest of efficiency or economy of operation, or of safety at sea. There were some 123 items of servicing or betterment originally specified on the Wellington, and this list was aug-mented as the work progressed. Under betterments there were included the installation of an emergency 60 KW General Motors diesel, with General Electric generator set, complete with switchboard, parts, batteries, muffler exhaust pipe, etc. This, with the neces-sary deck stiffening, was installed in a new steel deck house on the after boat deck, port side. A complete Sperry radar set was installed, and in this connection there was provided a 230 volt D.C. input, 115 volt A.C. 60 cycle output converter, the power supply coming from the vessel's 230 volt D.C. circuit. A 35 foot steel mast to carry the radar antenna was installed above the pilot house, and fitted with a working platform and access ladder. Another improvement in equipment is the substitution of two motor-propelled 24 foot 37 passenger lifeboats for oar-propelled 22 foot 31 passenger boats. Davits, chocks, foundations, etc. were relocated to handle the larger boats. New ranges were installed in officers' and crew's galleys. Every part of the ship was inspected, and all necessary and many anticipated repairs were made. Fresh water com-partments and tanks were wire brushed, washed and painted or cement coated; cargo tanks were tested and re-paired and steam and other piping repaired or replaced. The boilers and turbines were found to be in excellent condition. New floors were laid in the boilers, using insulating brick and firebrick. Remote tubes were lanced, soot blower elements removed and inspected, and valves reseated or repacked. The turbines were opened up, and where necessary the rotors taken to the respective manufacturer's local shops for testing and cleaning. Condensers, generator turbines and governors were opened up, tested, and repaired where necessary. Main and auxiliary pumps, condensate pumps, fuel oil and lube oil pumps, bilge pumps, fire and general service pumps, main feed pumps, bilge and sanitary pumps, and stripping pumps were opened up, overhauled, or repacked or adjusted as needed. Fire equipment was inspected and renewed. Many of the motors were removed for cleaning, undercut-ting of mica, rewinding of armatures, or turning of commutators. The same with motor generator sets. All instruments were checked. The ship was drydocked for cleaning and painting. The bottom painting consisted of one coat of anticorrosive to seams and butts, and from keel to 18 foot draft line one coat of anti-corrosive and one coat of anti-fouling paint. Two coats of Apexior in way of rudder stern frame. From 18 foot draft line to 30 foot draft line two coats of red boottop-ping. Upon completion of repairs, a four hour dock trial was given the vessel by the vessel's personnel, after which she sailed, in fine condition, for her South Seas range. The entire job was a credit to the Moore Yard, although there was little opporrunity for any of the fine joiner work in which the yard takes special pride. 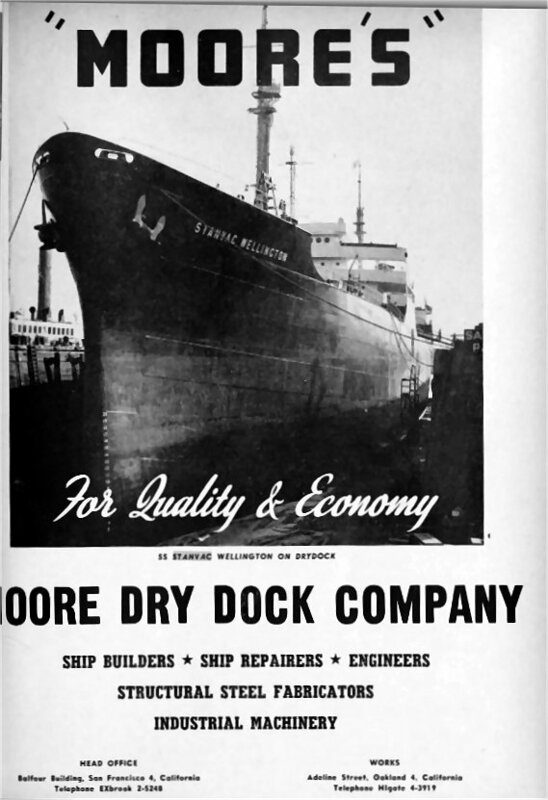 Advertisement by Moore Dry Dock Company.